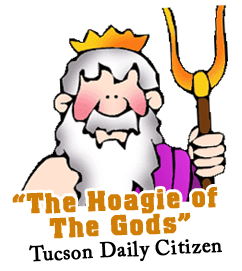 There are a number of different versions as to how the hoagie got its name, but no matter what version you believe, all agree on one thing…it started in Philadelphia, and in Tucson it started at the Hogie House! The most widely accepted story centers on an area of Philadelphia known as Hog Island, which was home to a shipyard during World War I. 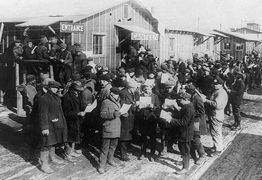 The Italian immigrants working there would bring giant sandwiches made with cold cuts, spices, oil, lettuce, tomatoes, onions and peppers for their lunches. These workers were nicknamed “Hoggies”. Over the years, the name was attached to the sandwich as well, but under a different spelling. Philadelphians Pat and Harry Olivieri are often credited with inventing the sandwich by serving chopped steak on an Italian roll in the early 1930s. The exact story behind its creation is debated, but in some accounts, Pat and Harry Olivieri originally owned a hot dog stand, and on one occasion, decided to make a new sandwich using chopped beef and grilled onions. While Pat was eating the sandwich, a cab driver stopped by and was interested in it, so he requested one for himself. After eating it, the cab driver suggested that Olivieri quit making hot dogs and instead focus on the new sandwich. They began selling this variation of steak sandwiches at their hot dog stand near south Philadelphia’s Italian Market. The sandwich was originally prepared without cheese; Olivieri claims provolone cheese was first added by Joe “Cocky Joe” Lorenza. Cheesesteaks have become popular in restaurants, cafeterias and food carts throughout the city with many locations being independently owned, family-run businesses. Variations of cheesesteaks are now common in several fast food chains. Versions of the sandwich can also be found in locations ranging from bars to high-end restaurants. 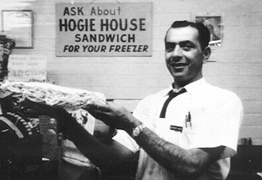 In the summer of 1960, George Raizk gave the Hoagie sandwich a home in Tucson, AZ. In addition to Philly favorites such as the Italian Hogie and the Cheese Steak & Onion, George added the Carmichael, 1/2 Moon Burger, and the Sack o’ Steak. If you ever wondered why we spell hogie without the “a” its because way back when the sign guy made our sign he messed up and forget the “a” so George being the nice guy he is just decided to stick with it. Over the years George treated everyone with the utmost respect. He cared a lot for Tucson, his customers and employees. We will dearly miss him. His family still runs the business and sticks to what George created. 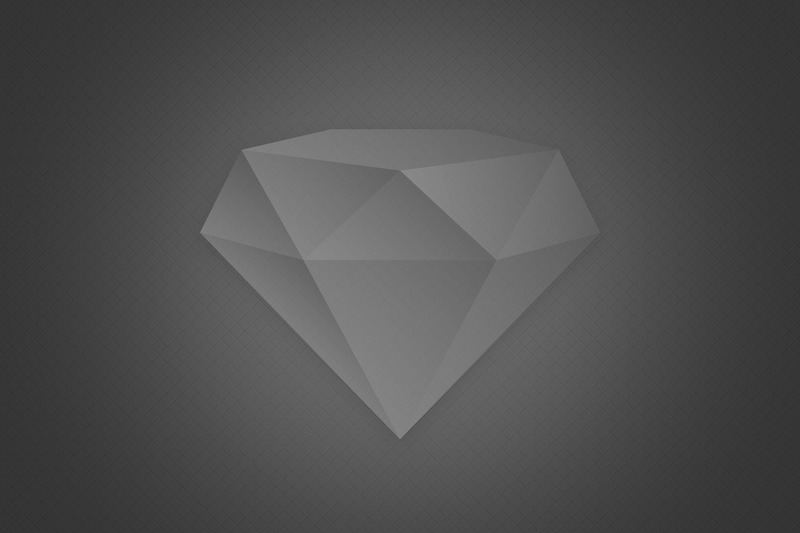 Come visit us sometime.